That's different, very pretty lace circles. I like that Ruth, lovely colours and lace circles. That's lovely Ruth. Fab die cuts. Lovely image and nice colour combination. 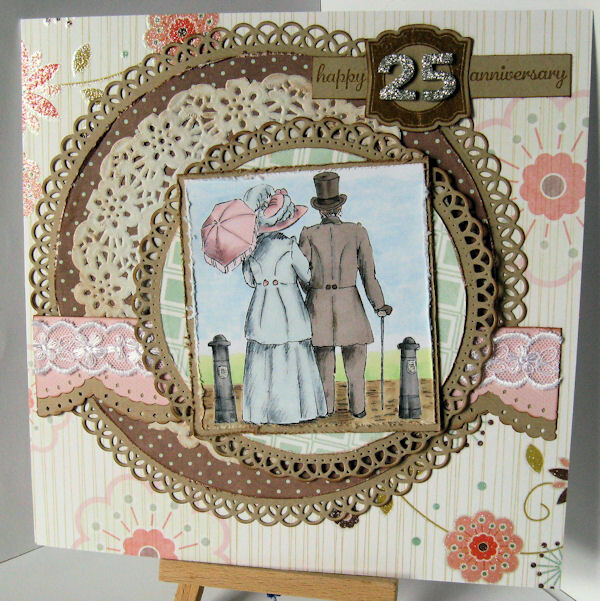 i think the coffee coloured diecuts give it a vintagey feel ,its lovely . Really pretty, Ruth, and I love the colours. Lovely, they should be thrilled with this. Love it, and agree about the colour of the die cuts! Reminds me of a photo we had taken to celebrate our engagement; we were at Blist's Hill Museum at Ironbridge and had one of those 'victorian outfit' pics taken. Our kids thought for a while that we had been around for at least a century! Scrap Monkey wrote: Love it, and agree about the colour of the die cuts!